Composite bonding is a type of specialist cosmetic treatment that involves using tooth-coloured composite resin to reshape teeth. The treatment is often reversible as there is usually no need to drill the natural tooth, with the composite being bonded onto the tooth surface. It can be used as an alternative to veneers in certain cases. 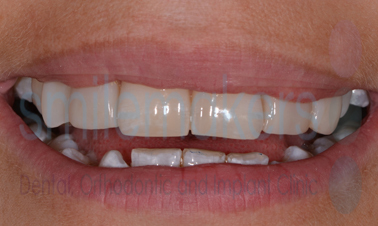 We have both had major treatment, which included crowns, bridges, veneers and tooth whitening. At all times Smilemakers made our comfort and wellbeing paramount and great care was taken to make the treatment as pain free as possible. 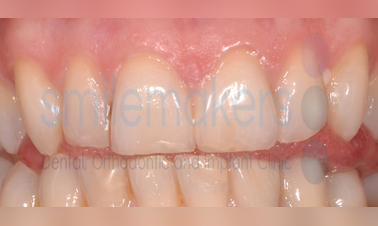 We are both very pleased with our teeth and Smilemakers has now given us the confidence to smile more openly. Hazel attended Smilemakers unhappy with the effect that her missing lateral incisors were having on her otherwise lovely smile. After discussing the various options, she decided to try composite bonding to reshape the teeth and disguise the fact that the teeth were missing. 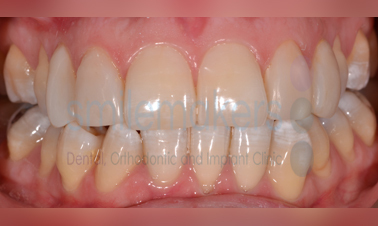 This treatment is completely reversible because the composite is bonded onto the outside of the tooth, and no anaesthetic was required at any stage. She is currently considering some further composite bonding on her premolars to complete the treatment and give her a broad flashing smile. Am I suitable for composite bonding? Your suitability for composite bonding will depend on many factors, such as the position and colour of your teeth, but also what you would like your final smile to look like. Generally your teeth will need to be in good condition with enough tooth enamel to bond the composite onto. How long will the composite bonding last? 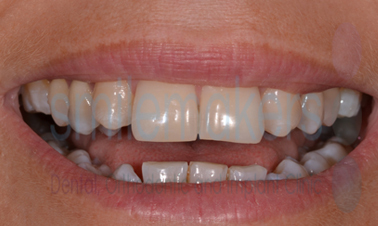 The composite resin used is designed specifically for this treatment and is very durable. However, it is still not as strong as porcelain and can chip and break. The longevity of the treatment will be determined to a large degree by how the teeth are looked after and any potentially destructive habits you may have. These will be identified to you by your Smilemakers dentist.